"If movie audiences think of me as a small-town American boy, born of God-fearing parents who were endowed with a sense of humor, they are right. My parents, Alexander and Elizabeth Stewart, were deeply religious, and both had a saving sense of humor." -James Stewart, Saturday Evening Post, 1961. During the bleak years of the Great Depression, millions of Americans turned to the local movie theater to forget their sorrows, and enter dreams of adventure, love, and happiness. The transition from silent films to "talkies," as early sound pictures were called, had begun only a few years before the stock market crash in 1929. The first generation of film stars in the talking pictures appeared during the bleak years of the Great Depression. Many of the stars were Pennsylvanians. At the beginning of the decade, Americans delighted in the anarchic comedies of Philadelphia's curmudgeonly W. C. Fields and found escape in a string of successful musical comedies starring Philadelphians Jeanette McDonald and Nelson Eddy. In the 1930s, the Barrymore siblings - Lionel, Ethel, and John - would take their celebrated thespian skills from stage to film. Near the end of the decade, the son of a hardware store owner in Indiana, Pennsylvania, James "Jimmy" Stewart (1908-1997), would emerge as the film personification of the noble American Everyman. When Jimmy Stewart graduated from Princeton University in 1932, the Great Depression was entering its bleakest years. Unable to find a job in architecture, his major at Princeton, Stewart moved to New York hoping to make it as a Broadway actor. But steady jobs were rare and so were good meals. "[T]hat year, 1933, I worked only three and half months," Stewart later recalled. "I was almost six feet four and at that point I weighed a hundred and thirty pounds. At six feet and one hundred and thirty pounds I worried about my bones showing." After appearing in eight Broadway plays - and rooming with another aspiring young actor, Henry Fonda, in New York - Stewart appeared in his first Hollywood movie, The Murder Man, in 1935. Stewart's life changed when director Frank Capra cast him as the leading man in You Can't Take It With You (1938), a film based on a play by George S. Kaufman and Moss Hart about how the wisdom of the common man triumphs over the demands of big business. The most celebrated director of the decade - along with Walt Disney - Capra had already won two Oscars for It Happened One Night (1934) and Mr. Deed Goes to Town (1936). In 1938 he would win his third for You Can't Take It With You. Stewart was a wonder as Ivy League student Tony, who rebels against his father's wishes that he get a job on Wall Street. The next year, Capra and Stewart teamed up again in Mr. Smith Goes to Washington (1939). Stewart's endearing portrayal of the young man from a small town who takes on the corrupt politicians in Washington, won him his first Oscar nomination. 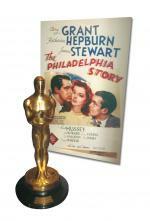 Stewart would win his first Oscar for best actor, the following year, for his role as tabloid reporter Macauley Connor in The Philadelphia Story. Stewart's most famous role was his portrayal of building and loan manager George Bailey in the 1946 Frank Capra classic, It's A Wonderful Life, a film that also starred fellow Pennsylvanian Lionel Barrymore as the Scrooge-like Mr. Potter. Although made after the end of World War II, the film harks back to the hard economic times of the Great Depression and the moral trials of the common man that Stewart had come to personify on the Silver Screen. Today, It's A Wonderful Life remains one of the Christmas holiday season's most popular films. During World War II, Stewart was part of a large entourage of Hollywood actors, including Clark Gable, Tyrone Power, Alan Ladd, David Niven, and Robert Montgomery, who enlisted in the armed forces. Having earned a pilot license in 1936, Stewart joined the U. S. Army Air Corps and piloted B-24s in twenty combat missions over Europe. He was decorated with the Air Medal, the Distinguished Flying Cross, the Croix de Guerre, and seven battle stars. After the war, Stewart became a member of the U.S. Air Force Reserve and in 1959 was made a brigadier general. When speaking of his military experience, Stewart displayed his trademark humility. "I had a lot of close calls…the whole thing was a close call. [However,] I was just doing my duty." His emphasis on moral principles and values, as exemplified in his military services and in his movie roles, endeared Stewart to generations of movie audiences. In 1980, Stewart received a "Life Achievement Award" from the American Film Institute, and in 1984 a second Oscar honoring his career accomplishments. 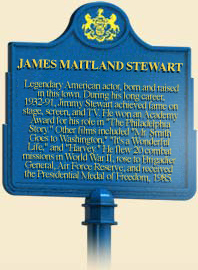 James Stewart died in 1997. 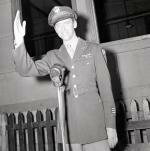 To learn more about Jimmy Stewart's life and career, click here. Gary Fishgall, Pieces of Time: The Life of James Stewart (New York: Scribner Book Company), 2001. Lary May, The Big Tomorrow: Hollywood and the Politics of the American Way (Chicago: University of Chicago Press), 2000. Richard Glatzer and John Raeburn, ed., Frank Capra: The Man and his Films (Ann Arbor: University of Michigan Press), 1975.